Fisheries Minister George Eustice announces more freedom to bank and borrow quota and funding for new fishing gear. More freedom to bank and borrow quota and funding for new fishing gear under the £43m European Maritime and Fisheries Fund will be officially announced by Fisheries Minister George Eustice in Selsey today as part the government’s plans to help fishermen prepare for the discard ban. Speaking to an audience of fishermen the Minister will set out how the latest phase of the discard ban will bring an end to the wasteful practice of throwing fish back overboard, alongside the important flexibilities the UK Government is putting in place to ensure it doesn’t impact negatively on their business. This ‘demersal discard ban’—which will come into effect from January 2016 for fishermen targeting species such as haddock, sole and plaice—follows the successful introduction of a ‘pelagic’ ban in January. If we want a profitable fishing industry and thriving coastal communities in the future it is vital that we fish sustainably today. That is why the reforms we have secured to the Common Fisheries Policy, which will put an end to the shameful practice of throwing perfectly good fish overboard, are so important. It is essential that we ban the practice of discarding fish, but we are also committed to introducing new flexibilities to help fishermen manage their quotas and will be giving more quota to the under 10 metre fleet. European Maritime and Fishing Funding – will be available when the scheme opens to purchase or develop new and innovative gear for more selective fishing and help industry to develop new markets for fish that were previously discarded. Increased quotas from the European Commission – to take account of the fact that discarding should no longer be occurring. More freedom to bank, borrow or swap quotas – to give fishermen more flexibility over their business. Exemptions – based on the survivability of a species once caught. While exemptions secured on behalf of the UK’s fleet are based on scientific evidence, the gradual introduction of the ban in phases will allow the UK Government to monitor its progress and the impact on fishermen, helping to avoid disproportionate costs and adapt to the industry’s needs. Crucially, fishermen can expect to receive increased quotas from the European Commission to take account of the fact they will not be throwing away fish. In line with a manifesto commitment to support smaller fishing communities, the Government will be allocating the first 100 tonnes of any additional quota received—and 10% of anything more we receive on top of this 100 tonnes—to the English inshore fleet. Decentralise decision-making – giving the UK more powers to manage our own fishing industry. Together with the quota system, which sets fishing levels each year, the ban will play a crucial role in the UK achieving sustainable fishing levels by 2020, a cornerstone agreement of the now-reformed Common Fisheries Policy. The pelagic discard ban came into effect in January 2015. This has meant all fishermen targeting mid-water species, such as mackerel, have had to land all the fish they catch, putting an end to the million tonnes of fish that had previously been thrown back every year, dead, into European waters. 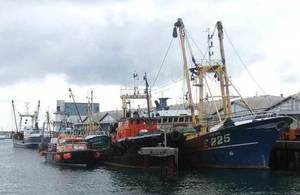 The Marine Management Organisation’s (MMO) guidance for fishermen is available here. This outlines which fish come under the demersal discard ban and what fishermen need to do with their catch. A complete ban on the discarding of all quota species will be in place by 2019. For more information, contact Defra Press Office on 020 7238 1542.